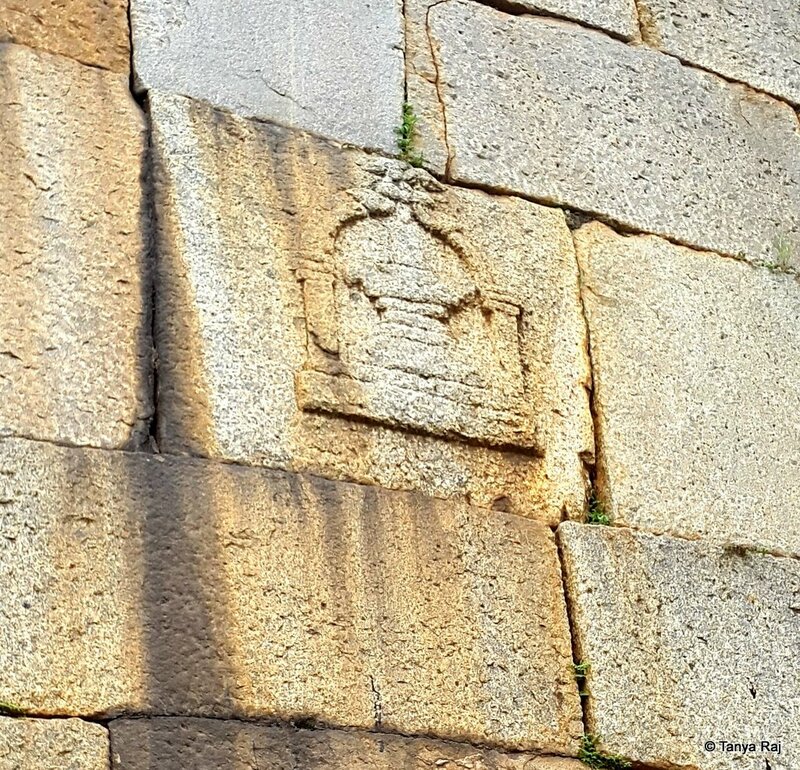 As the needle thin drops of rain persisted from the early morning, cloudy monsoon skies, I made my way in an auto-rickshaw to Chamrajpet to witness a piece of history in the heart of Bangalore. At the junction of KR Road, the auto turns left onto Albert Victor Road. Immediately after the bend is my destination on the left side – Tipu Sultan’s Summer Palace. 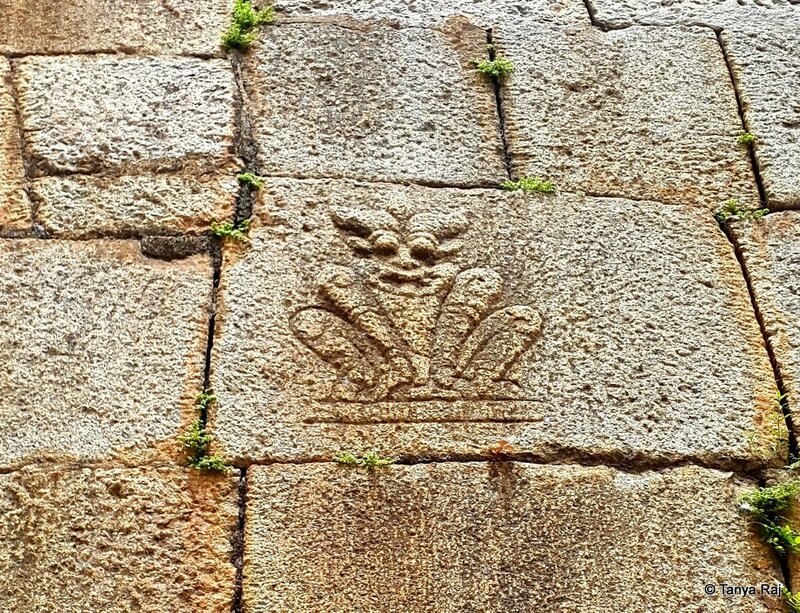 The outer facade of the Palace has been subject to nature’s changing seasons. 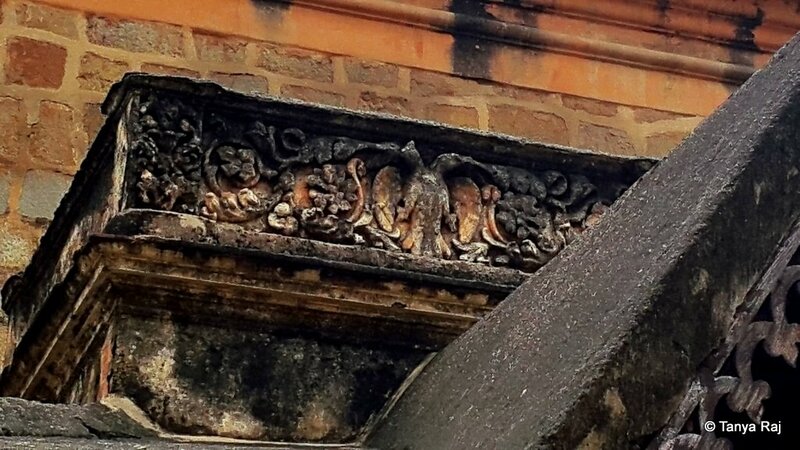 Even though there is regular maintenance, a lot of the past glory that would have been associated with this Palace, is hard to find today. Two layers of metal gates 4-feet tall in height serves as an entrance to the place. Outside on the right is a 2-feet tall cement plaque, jutting out of the ground, with painted black letters informing of this historical structure. The name of the palace is written in Kannada, Devanagari and English scripts along with the years it was in use – 1778 to 1789. On the left side is a small ticket counter covered with rusted iron grill. A corroded wooden plank next to it lists out the price: Indians Rs. 5 and foreigners Rs. 100. An ancient looking temple dome, plastered in pale yellow paint, peeks from among the tree canopy behind the ticket counter, which I later learn was built in the 1600s. I wait outside for my Sherpa (guide) to arrive. The road lined with thick-trunked Gulmoher trees, hang low with their long branches and brush on the pedestrian’s head. Across the road stands a questionable Sulabh complex teeming with people waiting for their morning ablutions. 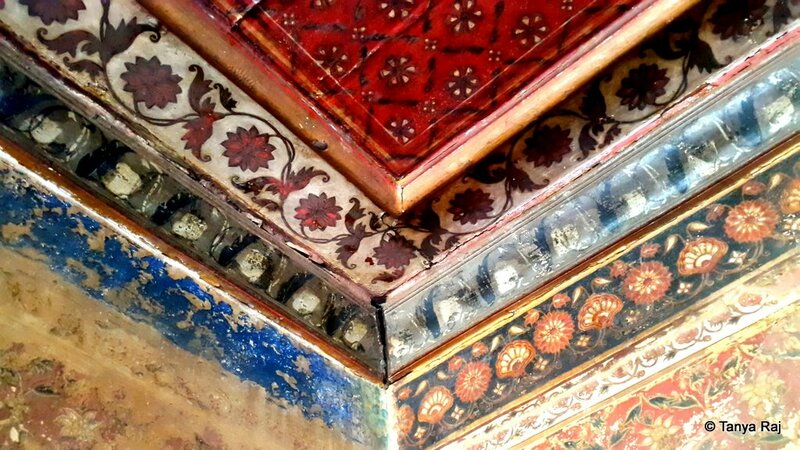 The interiors have been painted with chemical paint, but the intricacies of the architecture and its influences don’t escape the eye. 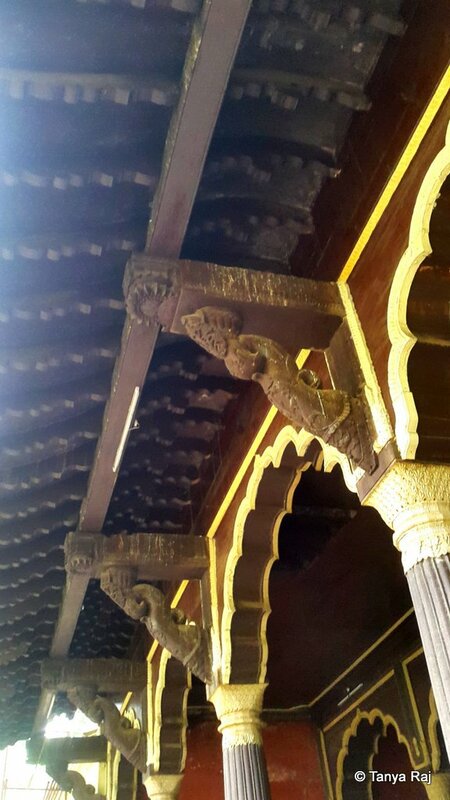 The small projections connecting the roof to the wooden beams are reminiscent of the architectural style that can be found in Kerala houses. After about 15 minutes, I see a young 20-something boy walking towards me. Shyly he apologises for his late arrival and I realise that he is to be my guide for the next 2-3 hours. This thin, bespectacled, chatty young man, with a backpack on his shoulders, wearing a grey sweatshirt and a cap backwards, is nothing what I expected my guide to be1. By the end of the tour he had managed to surprise me even more with his immense knowledge not only about the place but also about the city’s history. These symmetrical arches resplendent of the Mughal architecture is in the Palace’s backyard, which originally used to be the entrance. He presents the tickets of the guard at the gate and we enter the complex. The small and narrow walkway leading up to the palace is flanked by short manicured grass of either side with banana, ashoka and palm trees standing at the far ends. The palace itself is just a storey high. The walls outside are painted in the same pale yellow paint as the temple dome. 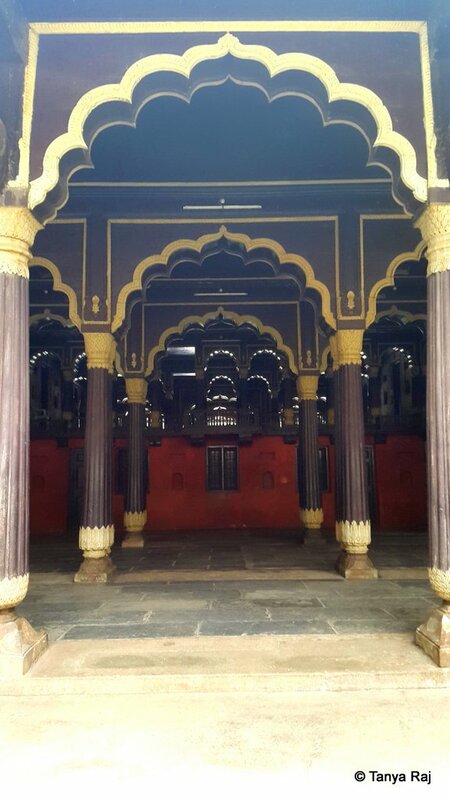 The entrance is five arches, between floor-to-roof thick wooden pillars. The entire palace is made of the wood that seem to be have been recently coated in a deep chocolate brown chemical paint. The ornate arches resplendent of Mughal architecture have flowery motifs in yellow at the base of the pillars. 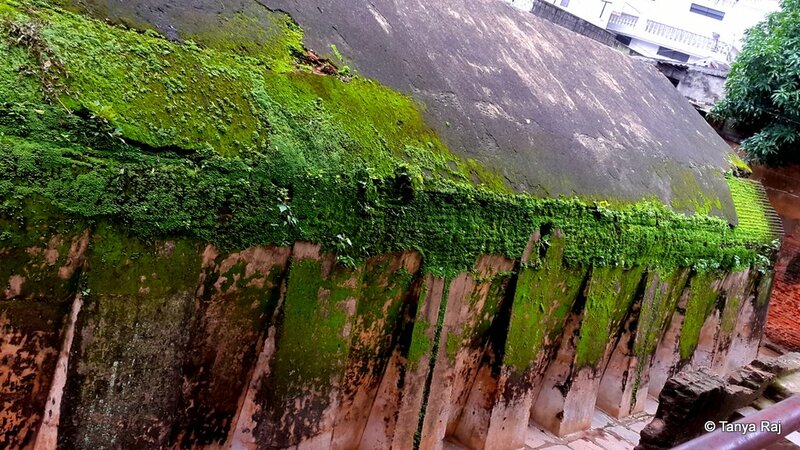 The small jutting roof outside is covered in musty greenish-brown lichens, due to the constant exposure to rains. The place emits a nostalgia and still echoes of the past magnificence that this Palace would have been. Not a grand 300-bedroom palace, but open and airy – one which served the purpose as the Sultan’s summer home. A flight of steps on either side of the structure, leads to a mezzanine floor. 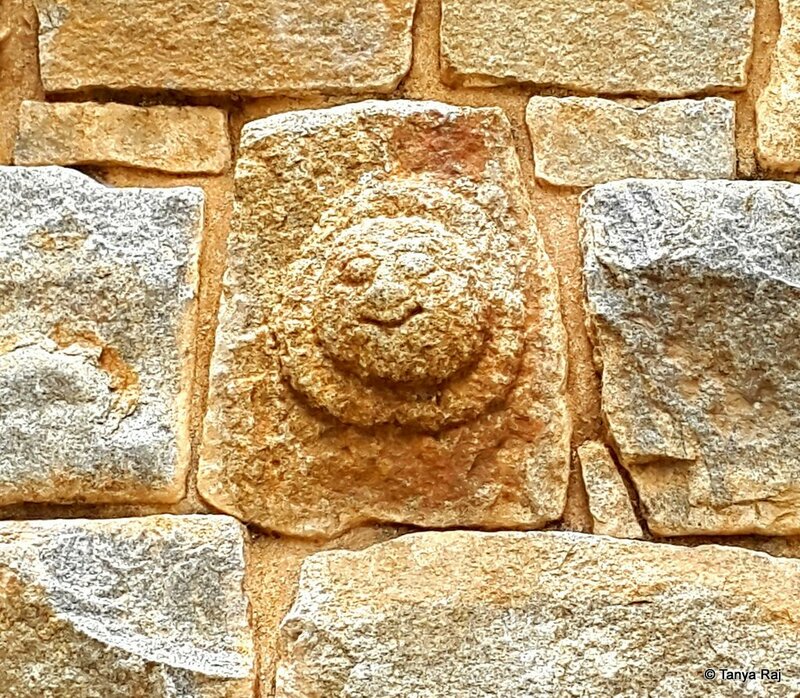 At the base of the steps a stone plaque embossed in the wall with Arabic and Persian scripts reads out “Abode of Happiness”, “Envy of Heaven” and “Pride of the East”, apparently the names given to this place by Hyder Ali and Tipu Sultan. 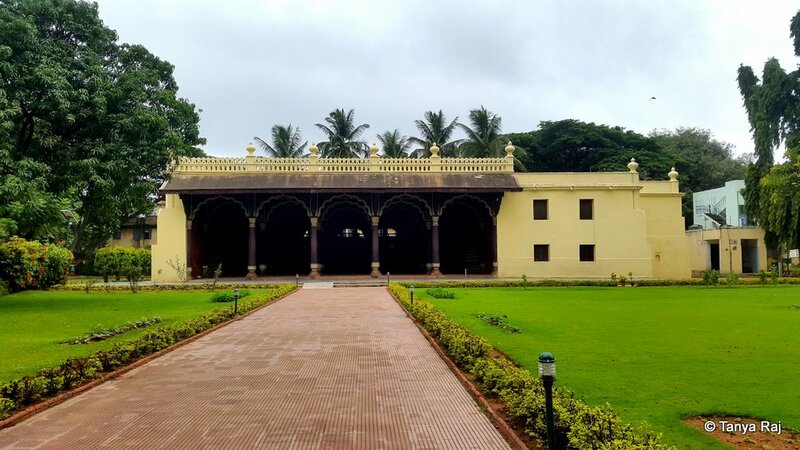 The palace’s construction was started by Nawab Hyder Ali Khan – a Persian commander who later was nominated as Sultan (de facto ruler) of Mysore – in 1781 and completed by Tipu Sultan2 – Hyder Ali’s son and later king of Mysore – in 1791. 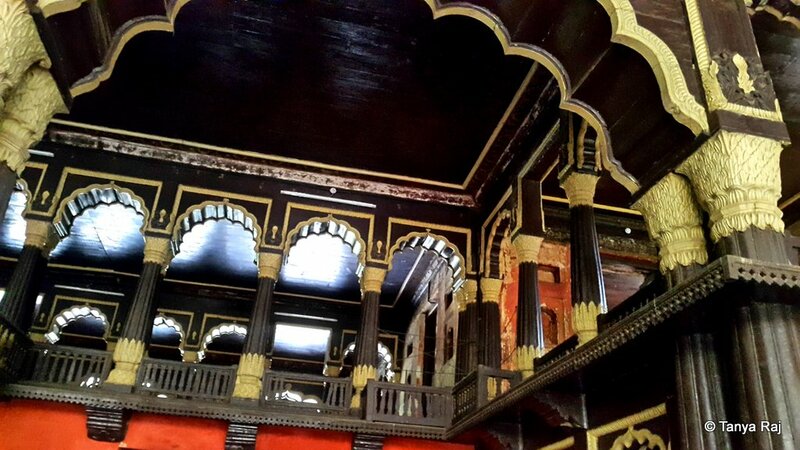 The Durbar Hall was used to conduct everyday administrative proceedings by Hyder Ali and Tipu Sultan, during their residence here. 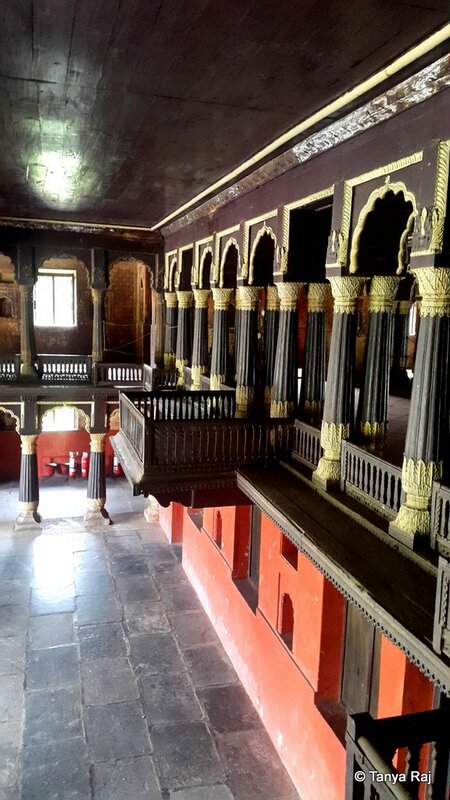 The mezzanine floor has 4 open chambers on all four corners, connected by a long corridor – The Durbar Hall – with small wooden balconies. 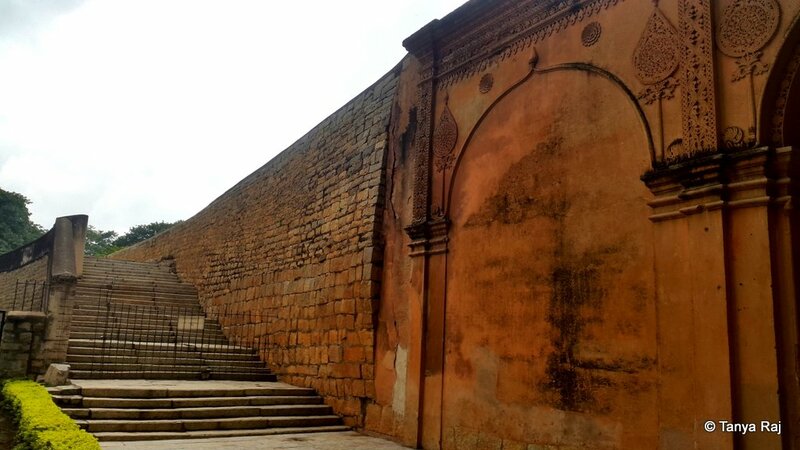 The corridor, which originally had 100 pillars in French architecture similar to that found in Pondicherry, overlooks the backyard of the palace. My guide informs that the current backyard used to be the entrance earlier. It has twin floor-to-ceiling pillars, constructed in the Hindu element of architecture reminiscent of houses in Kerala. The wood all over felt moist to touch and was covered in a visible thin film of mist. I ask my guide about this and he requests me to inspect the wood closer. On taking a look, I notice that there are absolutely no joints in any of these tall pillars. These are single blocks of rosewood that had been seasoned by immersing in the Cauvery River for over a year, and the moisture still remains, even after 200 years. 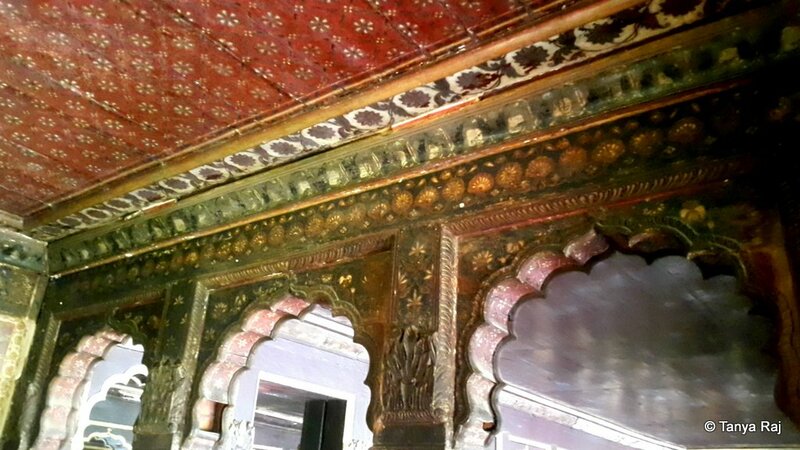 The bright wall murals were created with organic colours and barring some erosion has managed to survive 200 odd years. It is fragile and needs care and protection. 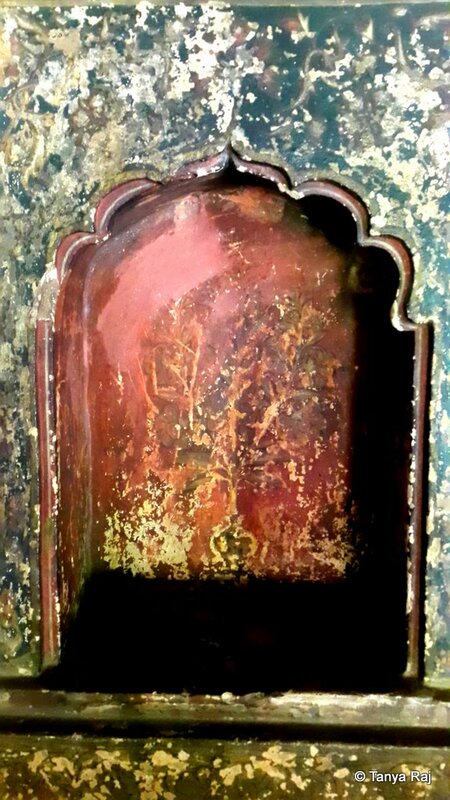 We walk to the four chambers on each end, out of which only one remains preserved in its original form, albeit with some erosion. 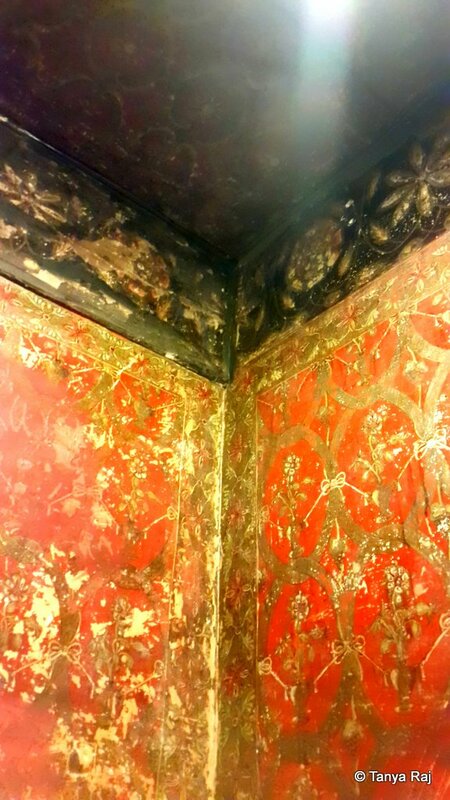 The chamber’s walls and ceiling are covered in Islamic motifs of flowers which represent nature’s interconnectedness along with French motifs of vase, vines and stars. The murals were painted on thin canvas sheets, in organic colours of red, green and blue derived from trees and flowers, and then stuck to the walls and ceilings, much like the wallpapers of today. The floors used to be covered with Persian rugs that would mirror the ceiling’s motifs. 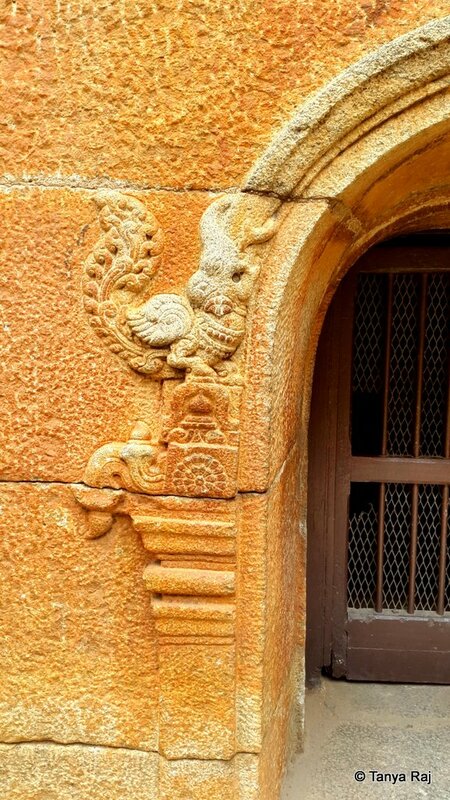 After Tipu’s death, the British used this palace as an administrative centre and some of their logs talk about an elaborate water fountain, which today is nowhere to be seen. 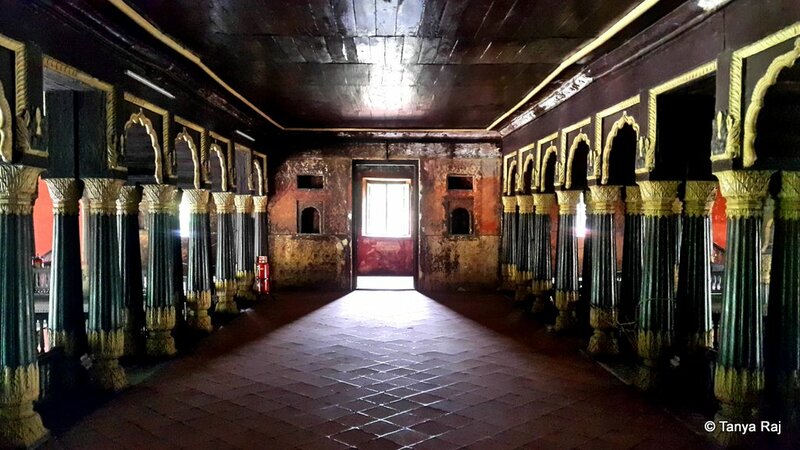 Later we walk down to the small closed chambers below the Durbar Hall, which has been converted into a mini museum. In delicate glass boxes we see a replica of Tipu’s famous Tiger Organ3; the originals today rests in the Victoria and Albert Museum in the UK, along with the indigenous rockets designed by him, that were used for the very first time in warfare. 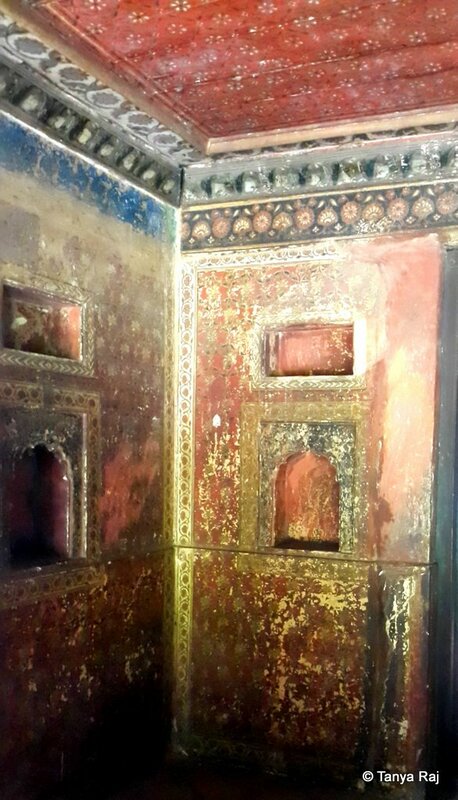 The next room’s walls are adorned with paintings of Tipu’s life, the palace and his Octagonal Throne. The throne had eight legs in the shape of a tiger’s paws and a golden tiger at the front. The throne had a canopy in the shape of a Huma’s plumage – a bird of Persian origin4. 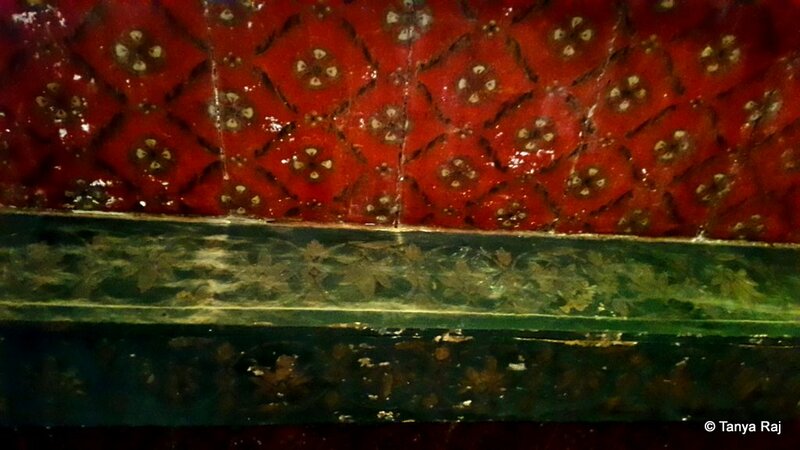 My guide informs me that Tipu never ascended this throne as he had taken an oath to sit on it only when the British were defeated from Indian soil. Post Tipu’s death, the British tried to sell it without any luck, and so reduced it to parts and finally auctioned it off; some of it was also gifted to the then monarch of UK. Once used as storage of warfare materials, today this historic building – the last remaining armoury – is in a dilapidated condition, encroached upon and used as a druggist hideaway. After about an hour of exploring the Palace, my guide leads us to the one remaining armoury out of the 5 that once existed. Walking through the tiny lanes of Kalasipalyam, we come upon a non-descript hut and make our way around it to the backyard. It is then I realise why my guide had been discreet and slightly uncomfortable on his way here. 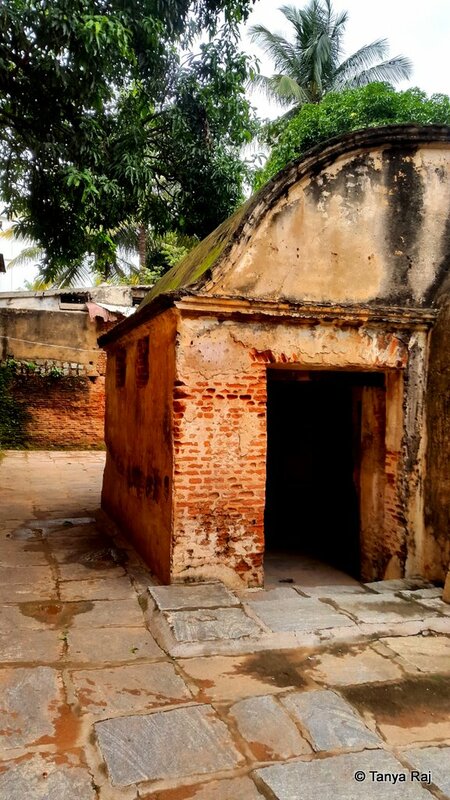 This historical monument, which once was used as a storage space for gun powder and cannonballs is now an encroached property. 500 meters below the ground level – essential to avoid the enemy’s eyes and keep the gunpowder cool – this arch-shaped enclosed stone structure is also being used by the wayward of the society as the presence of empty syringes indicate. The outside walls are covered in fresh green moss and the inside is dark and damp with only a shaft of light filtering in through a cut in the end of the structure. The entrance to the Fort walls. On the right at about 50 meters is the exact location from the wall was breached. The stairway outside that leads to the dungeons below. Our last stop for the day is the last remaining section of the Fort walls, especially the one through which the British breached the city. In a pulsating corner of the KR Market, the yellow stone walls of the fort make for a dichotomy. 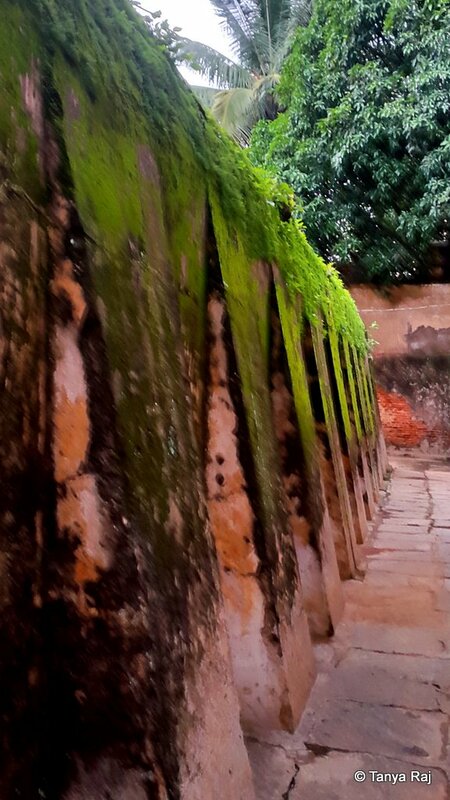 A huge wooden door covered in spikes leads us to a sprawling green lawn in the centre of the walls. 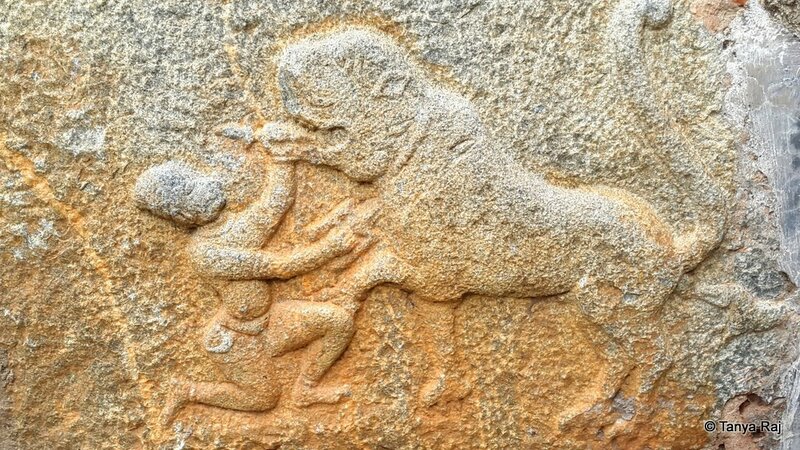 The stone blocks are etched in images of Tipu fighting the tiger, erotica and general murals. A flight of broad stairways outside the fort leads to the dungeons below which are restricted for entry. 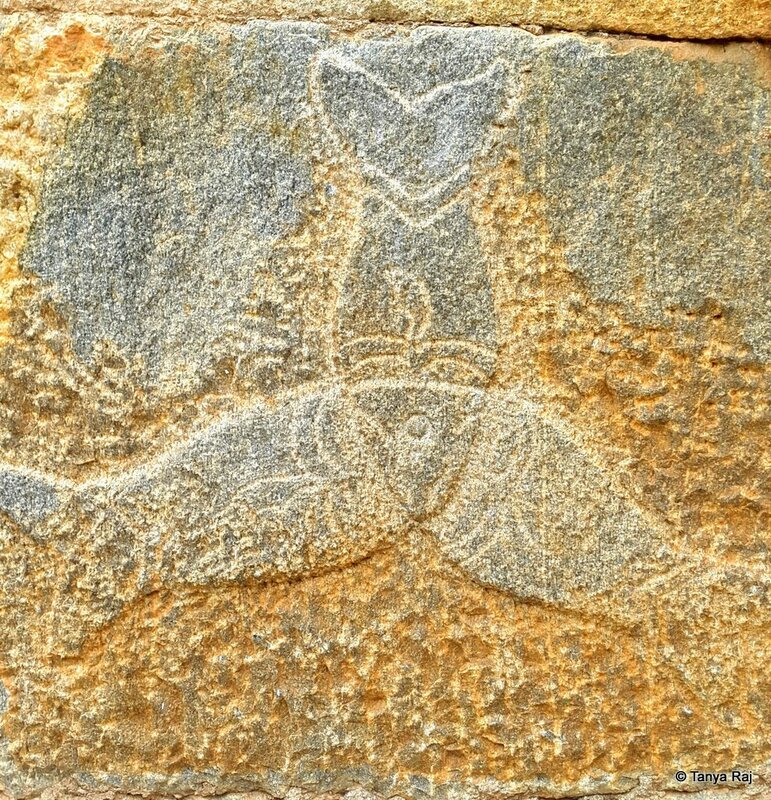 The various murals etched on the fort walls were used as direction signs, much like the Google Maps of today. 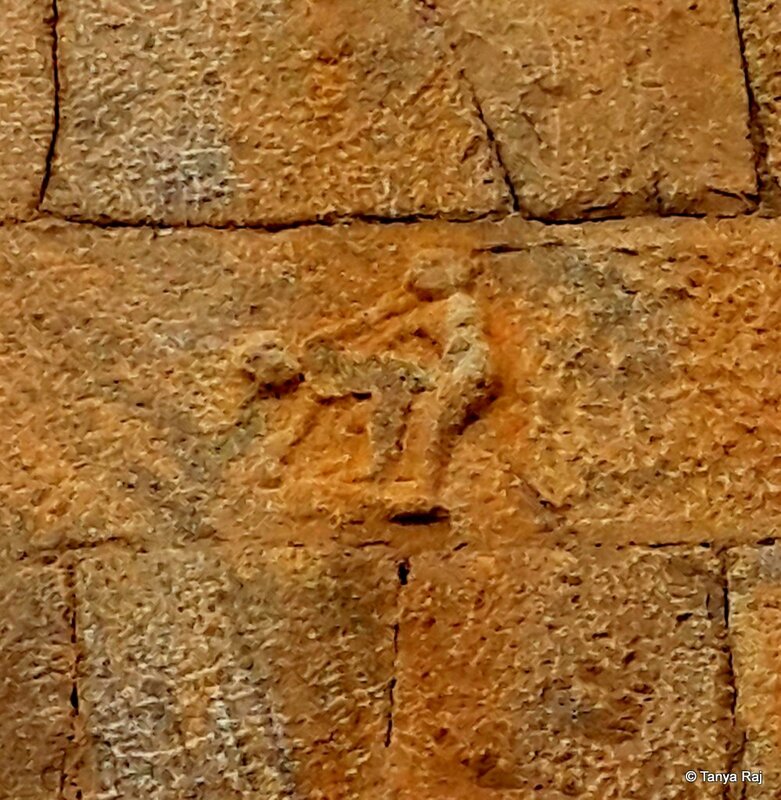 Closer inspection of these etchings reveals a craftsmanship and safety strategies, both defensive and offensive, that were way ahead of their time. As we come to the end of the tour, I was left richer with the knowledge of the city I have called home for the past decade or so, along with an unprecedented respect for our ancestors – for their hunger for innovation and their dedication to their country. 1At his request, I am not disclosing my guide’s name.